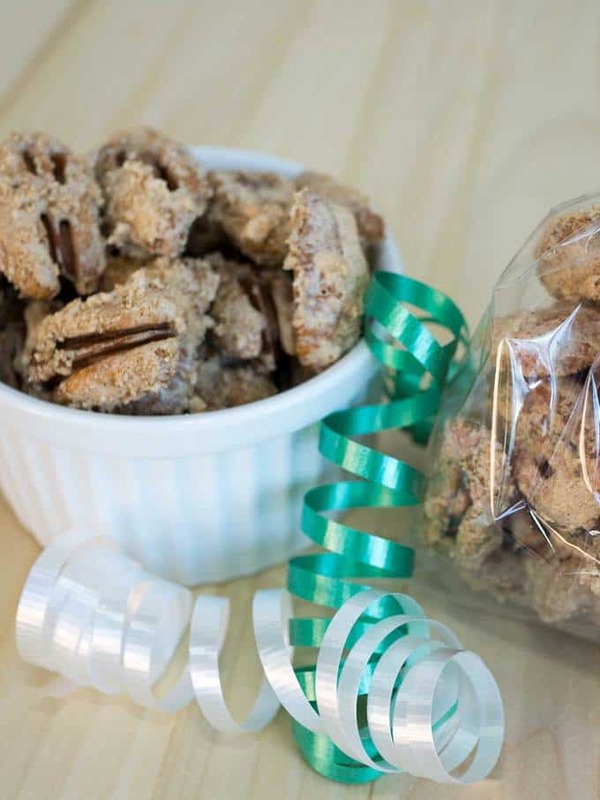 Southern candied pecans are a perfect make-ahead holiday gift for your friends and family. They’re super simple to make, and stay deliciously crunchy when packaged in airtight containers. When I was growing up, we had a lot of pecan trees in our yard. In the fall, I used to love to wander around the yard picking up these delicious nuts, cracking them with my hands, and eating them. Years later, it’s still difficult for me to buy them in the store. However, because they’re so incredibly good in so many recipes, I keep a supply in my freezer year ’round. 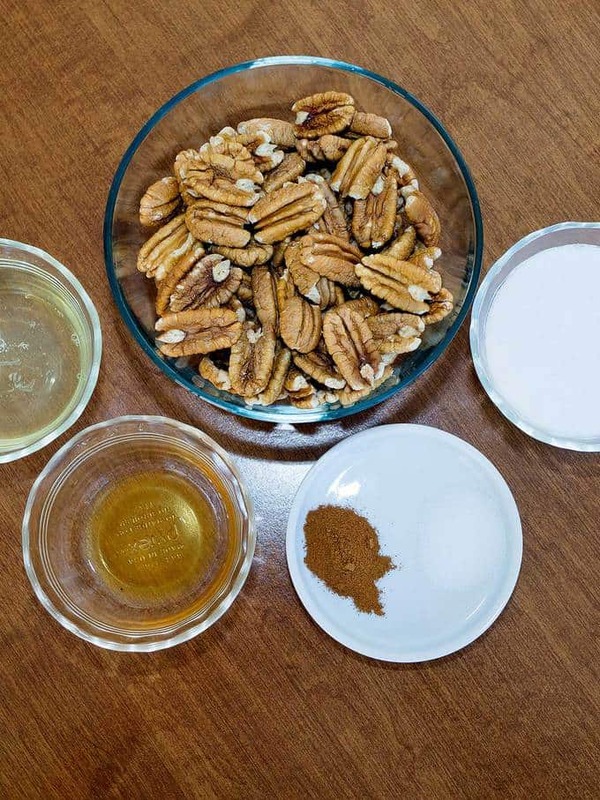 The ingredients for this delicious confection include pecan halves (of course! ), egg white, vanilla extract, sugar, ground cinnamon, and salt. As a first step, I beat the egg white with my electric mixer until frothy. Then I added the vanilla, sugar, cinnamon, and salt, and continued beating the mixture until it was thick and well mixed. Next, I folded the pecans into the egg white mixture with a wooden spoon until the pecans were well coated. Finally, I spread the nuts in a single layer on a baking sheet lined with non-stick aluminum foil. Into a 250° F oven the pecans went for an hour and 15 minutes. Every 15 minutes, I stirred the nuts to ensure that the coating was completely dry. I removed the nuts from the oven, and cooled them completely. 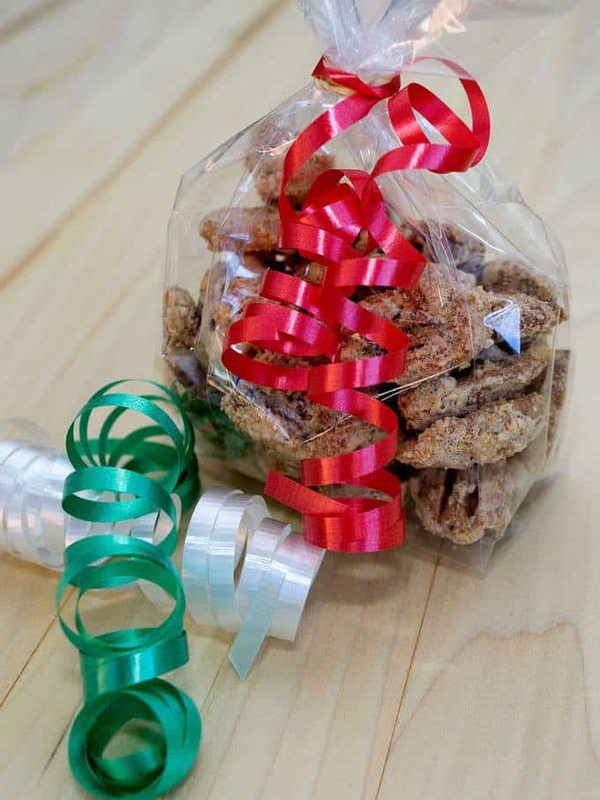 I like to package the Southern Candied Pecans in clear food grade polypropylene bags secured with a rubber band and tied with a pretty ribbon. 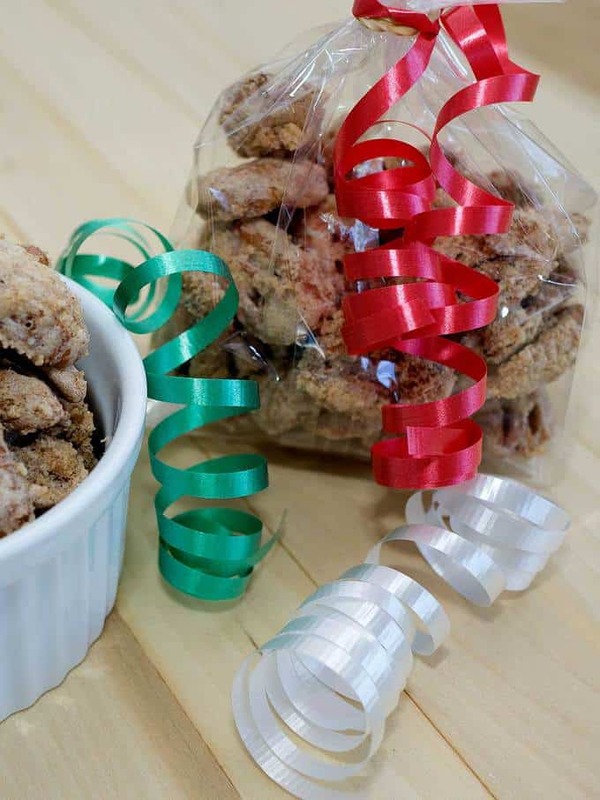 You could also package them in decorated Mason jars, tins, or clear piping bags. These nuts are totally addictive! Kept in an airtight container, they retain their crunchiness for several weeks, if they last that long. Yum! Preheat oven to 250° F. Line a large baking sheet with non-stick aluminum foil*. In a medium mixing bowl, beat the egg white until frothy. Add the vanilla extract, sugar, cinnamon and salt; beat until mixture thickens. 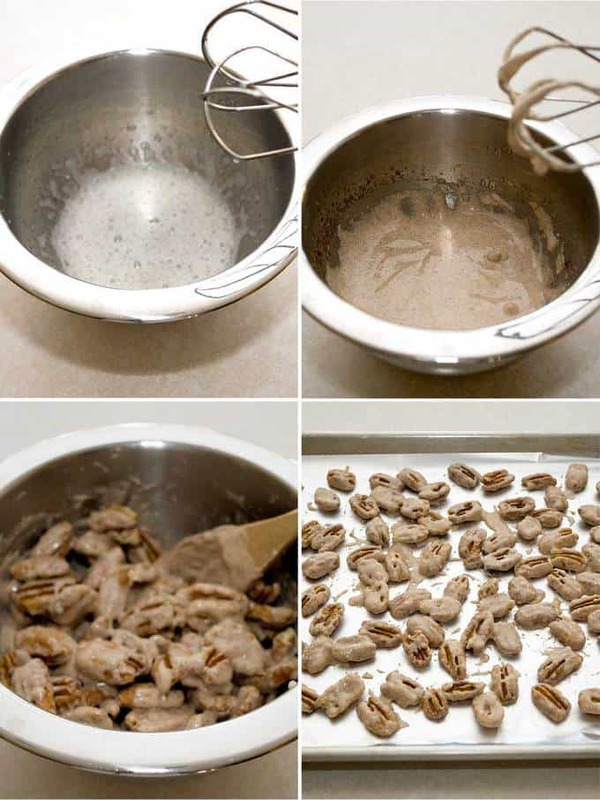 Fold pecan halves into egg white mixture with a wooden spoon until well coated. 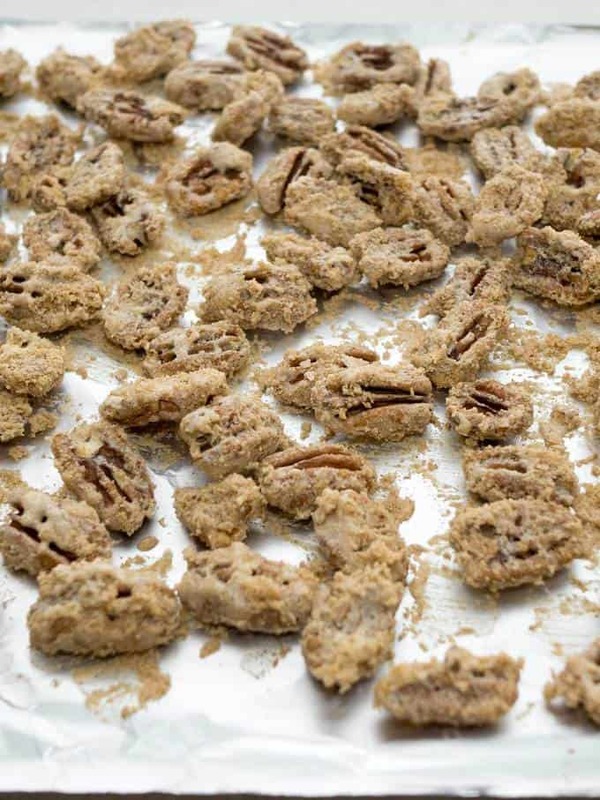 Spread coated pecans on a single layer on prepared baking sheet. Bake until coating is perfectly dry, about one hour and 15 minutes. Yield: 2½ cups. *Note: Grease the baking sheet well with butter or non-stick spray if you don't have non-stick aluminum foil.